Location: From the city of Kamloops head west on Hwy. #1 (Trans Canada Hwy.) for 75 km. (46.5 mi.) to the community of Cache Creek. Turn north (right) onto Hwy. #97 and travel to the community of Clinton. From Clinton turn left (west) on the Kelly Lake Road. Kelly is situated in Downing Provincial Park. (about 10 km./6 mi. southwest of Clinton). Resorts & Campsites: Kelly is located within the boundaries of Downing Provincial Park. The park has 25 vehicle campsites and picnicking /day-use areas. Cartop boats can be launced at the lake. Fishing Report: Kelly provides a fair to good fishery for Rainbows up to 2+ lbs. throughout the spring, summer and fall months. Pavilion Lake - Pavilion Lake is located due south from Kelly. By travelling south on the same road that brought you to Kelly Lake you will arrive at the small community of Pavilion. Pavilion Lake is located just a few kilometers to the east. The lake is 263 ha. (650 ac.) in size, at an elevation of 823 m. (2699 ft.). It is a Rainbow stocked lake that provides a fair fishery for trout reaching up to 3-1/2 lbs. 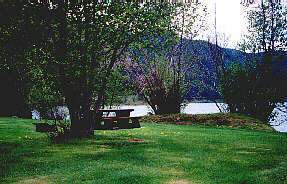 Marble Canyon Provincial Park is a small, quiet campground, set between two small lakes Turquoise and Crown. This park is popular with fishermen and birders. Nestled in the rugged Pavilion Mountain Range, it is 335 hectares and provides 30 campsites, with swimming and boat launching. A beautiful park and well worth your consideration as a family vacation spot. 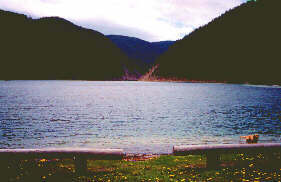 Crown lake is located just minutes to the southeast of Pavilion Lake. It is a small lake with a surface area of 18 ha. (45 ac.) at an elevation of 854 m. (2801 ft.). Good spring fishing for Rainbows up to 2 lbs. Cartop boats can be launched and campsites are available at nearby Marble Canyon Provincial Park. Turquoise Lake is found at the southeast end of Crown. It is another small lake with a surface area of 10 ha. (25 ac. ), lying at an elevation of 854 m. (2801 ft.). Like Crown Lake it is stocked with Rainbows that will reach an average size of about 2 lbs. Spring and fall are the best fishing months. Cartop boats can be launched and campsites are available at Marble Canyon Provincial Park.